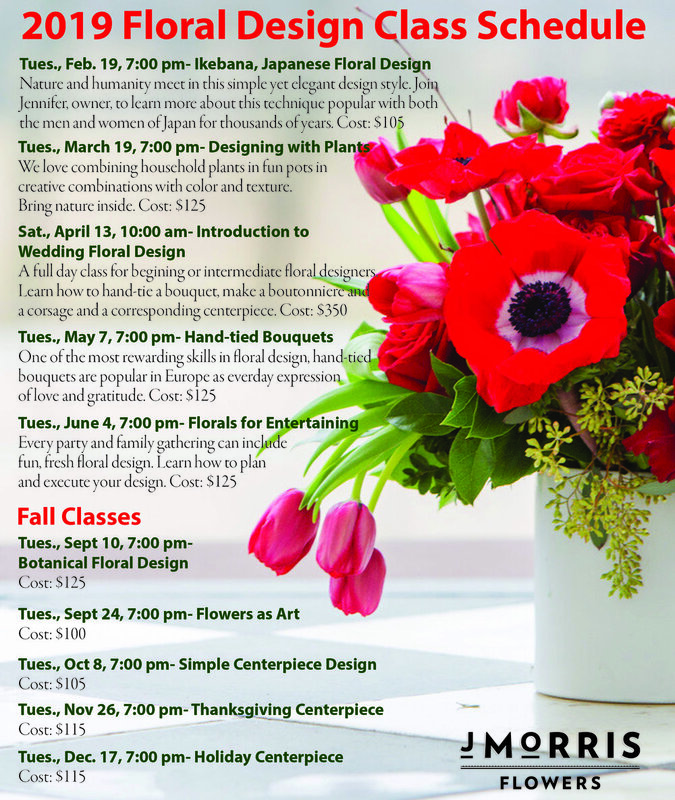 This is the third year that J. Morris Flowers has offered classes in our Leesburg studio and they continue to grow in popularity. Jennifer Morris, owner and director, has three main goals for the classes beyond just enjoying the friendship and community. The first is to help you weave flowers into your life for both the beauty they provide and for your own creative expression. The second, is to expose you to some of the beautiful flowers that you can’t get at grocery stores and big box stores. (We try to include new and interesting flowers in every class). In addition, she’ll use vases and containers that you’ll keep and use again and again. We do believe it’s all about that vase — and the flowers, of course. Third, she’ll get technical. Basic floral principles can be used with all sorts of designs and arrangements. You’ll soon be making flowers for your home and your friends. You’ll know what you’re doing and why youre doing it. Jennifer is skilled at working with students of all levels and members of our design team are always on-hand to answer questions. Whether you are a beginner or more advanced, you’ll get a lot from each class. Practice is so important, that’s why our cut flower bar will be a great way for you to access some of the lovely flowers that you will learn about. Want to speak to someone about the classes and how you can get involved? Email us at studio@jmorrisflowers.com and someone will contact you right away. Want to learn about our next class? Use the button below to find our Classes page.